Originally published in the WHO Goodwill Ambassador’s Newsletter for the Elimination of Leprosy, Issue No. 14 (June 2005). The information was correct and current at the time of publication. Nevis Mary finds a new role in life after leprosy threatened everything. She developed a fever, couldn’t move her body, was treated with traditional medicine and spent three years in bed. But far from improving, her hands and feet began to suffer from deformity. Still unaware of the nature of her disease, it was over three years before she was diagnosed with leprosy. Thereafter, she spent two years in hospital being treated. During that time, her father died of shock that his beloved daughter had leprosy, and her mother followed him to the grave two years later. In order to support herself and her three younger brothers, Nevis became an assistant in a college. But she didn’t last long in the job once her colleagues found out she was a person affected by leprosy. She contemplated suicide on a number of occasions, but things began to look up when she enrolled in a distance learning program to qualify as a teacher. Subsequently, she taught at public school for three years. Having been through so much, Nevis has clearly emerged a new person. But eventually the staff at this school, too, began to make an issue of her leprosy. It was at this point that she met Dr. P.K. Gopal, president of IDEA India, an association of and for leprosyaffected persons. Meeting a person who was speaking up on behalf of individuals with leprosy was a life-transforming experience for Nevis. 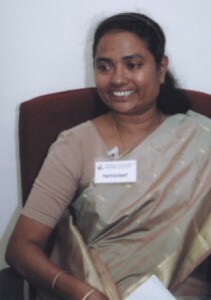 At his suggestion, she applied for a government job as a person with disability, and at the age of 33 became a clerical worker with the Indian Railways. Her older brothers and sisters had made no effort to help her, other than recommending she enter a sanatorium. But Nevis was determined to survive by herself. In Indian society, however, it is not possible for a woman to live alone. To have a husband is essential, so she looked to get married — no easy task for a woman affected by leprosy. Thanks to an introduction from a friend who understood her situation, she was married in 1993. She was 33, and her new husband, who taught German at high school, was 40. At the time, she told him that she had undergone various treatments for disability, including treatment for leprosy, but without clearly stating she had once had the disease. Her husband simply told her not to worry. Although her in-laws proved far less understanding, her husband is now fully aware that she is a recovered person and backs her completely. Fearful of losing her new job, at first she hid the true nature of her condition from colleagues. But as she became more involved in the activities of recovered persons, a coworker asked her what kept her so busy. “Actually, I’m someone who has recovered from leprosy,” she replied. After this, word spread and her close friends at work no longer ate lunch with her. But eventually, once Nevis had explained the disease to them, they realized there was nothing to fear, and now they are eating together as before. Having been through so much, Nevis has clearly emerged a new person — self confident, self-respecting and truly understanding of the anguish suffered by those with the disease. She stands firmly by them, encouraging them, speaking out boldly on their behalf at conferences and offering them a friendly ear.